Yet another year has passed, time for the celebrations of our 8th anniversary! Our traditional celebrations will last until the end of the year, and as every year you can participate in the painting and literature competitions for prestigious awards. The theme of this year's anniversary will be the Peasant Rebellion. As last year, there will be bonus points for following the theme in the competitions. For over seven years the Round Table ran on our trusty servers ad-free and solely supported by your donations. Unfortunately, keeping the site running smoothly and without delays or connection problems requires upgrading our hosting plan to a more powerful server package. At the same time, regular donations have decreased recently. So had to take the hard decision to start displaying ads. I'm still experimenting with the layout and placements, and try to keep them as unobstrusive as possible (e.g., there will never be nasty popups or similar!). Please see this as a possibility to support the running of this site. Should you be running an ad-blocker, consider deactivating it for our site - and click the banners whenever something interests you! With this you can support the running of this community, and it doesn't cost you anything. If you have feedback, please let me know below! 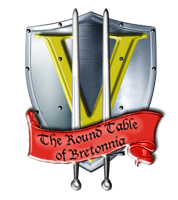 Just another year has passed for all the knights and ladies at the Round Table, this one marking our 7th anniversary! And, as predicted, we passed the 5000 registered members mark (an increase by almost 1000 since the last anniversary). No news of an army book yet, but who knows what this year brings. Our traditional celebrations will last until the end of the year, and as every year you can already wet your brushes and sharpen your pencils in preparation of the competitions to be announced. For the first time, this anniversary we will also have an "open" contest category, in which you can submit anything you like such as ideas, drafts, drawings, or other Bretonnian art. The theme of this year's anniversary will be the Errantry War. After seven years, we feel like our crusade finally reaches an end. You can still submit anything you like in the contests, but bonus points will be awarded for following the theme. Watch the site frontpage and this announcement for further information about the events to come. Update: Both deadlines are extended until December 10th. 5000 members registered on the Round Table! It is my pleasure to announce our 5000th member right here on the Round Table! User Acidicdevildog joined on April 12th from Wrexham, UK and has the special honour to be our member #5000. Congratulations and welcome to the Round Table!